First of all, this is a review of the Chuwi V99 quad-core Allwinner A31 Android tablet. The reason I need to highlight this is that there is another version of the Chuwi V99 that is powered by a dual-core Rockchip Rk3066. Both models look similar as in both look very much like an Apple iPad. All the major China tablet manufacturers have their own versions of the iPad clone. All of them come with a 9.7 inch 2048 x 1536 retina screen. A few of them, like Chuwi, even have multiple versions with different processors. The devices that Top China Tablets has reviewed so far are the Vido N90 FHDRK, Onda V972 and Pipo M6. The Vido N90 FHDRK and Pipo M6 both come with the quad-core RK3188 chip while the Onda V972 comes with an Allwinner A31 processor, like the Chuwi V99. The Onda V972 is actually quite a decent device with good performance overall except for one critical area. It had very poor battery life. As a result, it only got an average score from us. Since the Chuwi V99 had very similar hardware as the Onda V972, I was naturally worried about the battery life as well. Fortunately, I am glad to report that the Chuwi 99 actually has very decent battery life for a unit with a retina display. AliExpress has numerous retailers that are offering the Chuwi V99 at a great price and some even have free international shipping thrown in. 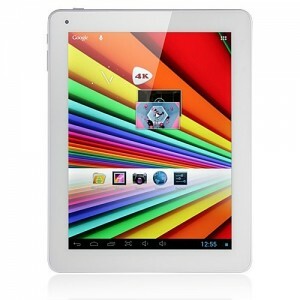 CHUWI V99 9.7" Capacitive Screen Android 4.1 Quad Core Tablet PC w/ TF / Wi-Fi / Camera - Silver. It is obvious that the China iPad clones are targeted at users who want an iPad like tablet without paying the price that Apple wants for it. The Chuwi V99 is a high-end clone that not only looks very much like an iPad, but it also has hardware specs that are very similar to an iPad especially the retina display. The display on the Chuwi V99 has the same size and resolution as a 4G iPad. The display is very high quality and has great color saturation, brightness and an almost 180 degree viewing angle. The Chuwi V99 actually looks more iPad-like than the rest. It has the same aluminum back cover with the curve around the edges. Of course there is no Apple logo at the center but if you were to stick a logo there, you can probably can fool most people. However, along the edges, the Chuwi V99 does have a lot more buttons and ports compared to an iPad. On the right edge (when held in landscape position) are a power button, a microSD slot, mini HDMI port, micro USB OTG port, power jack, microphone and 3.5 mm audio jack. On the to top right corner are Back button and a Volume rocker. This seems to be a rather standard port and button location for most of the 9.7″ tablets. The speakers are located on both the bottom of the right and left edges near the corners. I don’t really like the position of the speakers as they do get covered by my hands most of the time. However, like the button and port placements, this is also quite the norm for the 9.7″ tablets from China. Overall, the construction and build quality is fairly good. The unit is solid and does not feel like a cheap device. How does the Chuwi V99 compare with other tablets? If you look at the Chuwi V99’s specification list, it is almost an exact duplicate of the Onda V792. Besides the same display and processor, they both have 2GB RAM, 16GB ROM, 2MP front camera, 5MP rear camera, about the same size and weighing around 650g. They are almost the exact same size as well. The Chuwi V99 does have a slight higher capacity 9000 mAh battery instead of an 8000 mAh one in the V972. Since the battery life on the V972 was a major issue, this is certainly a good piece of news. The Allwinner A31 is a quad-core ARM Cortex-A7 CPU with a SGX544MP2 GPU. The Allwinner A31 performed well in GPU benchmark tests. It is a good chipset to be paired with a retina display tablet. However, it does not have as much processing raw power as a Rockchip RK3188. All in all, on paper the Chuwi V99 has quite impressive specifications for an iPad clone that costs less than half than what an iPad costs. However, we all know paper specifications only tell half the story. For the full story, let us check out how the Chuwi V99 performs. The retina display on the Chuwi V99 does demand a lot from the GPU. The Chuwi V99 performs well and fairly smoothly on most tasks such as web browsing, video playback and even gaming. However, it is obvious that the A31 strains when it is really stressed such as opening multiple tabs on the browser or running multiple apps at the same time. The device will lag a lot or just freezes up for a few seconds as the processor tries to catch up. During such times, the screen will be unresponsive to touch and if you tap a few more times as you most likely will when the screen freezes, those extra taps will be registered. For example, if you tap on the back button once and the screen doesn’t respond and you tap it a few times more, the running will go back a few screens. This can be quite frustrating at times. Strangely enough, the Chuwi V99 comes with a picture-in-picture or floating video feature that actually highlights this flaw rather than showcasing the tablet’s graphical performance. Floating video allows a video file be played in a separate window that floats on top of another app. The idea is that you can watch a video while working with another app like email for example. In reality, this function has very limited use. First of all, the 9.7″ screen is just too small to watch video and using another app at the same time. The video frame gets in the way all the time and you need to adjust it around. Secondly, playing the video actually slows down both apps. The video plays fine if you don’t touch anything. If you try to move the video frame around or scroll around on the other app, the video stutters and the other app suffers slowdown as well. The Chuwi V99 is obviously a little under powered for the retina display. However, if you bear this in mind and try not to strain the processor, you can get quite decent performance. Try to cut down on the number of apps running in the background and things run much more smoothly. The cameras on the tablet are nothing to shout about. Cameras on the China tablets are notorious for being there just to add another bullet point on the features list. Make use of the rear camera only if you have no other camera with you. The front camera is barely good enough for making video chats. One other thing to take note of is that the device cannot be charged via the micro USB port. It can only be charged using the included power adapter via the DC port. This is a big issue for me as chances are I will forget to bring the charger with me when I travel. If that happens, I will be lugging around a 650g 9.7″ tablet with me for nothing. While the Chuwi V99 has Google Play Store support, it does not have full support. A number of apps that should run perfectly well on the device are listed as not compatible. You can either side load these apps or you can update the firmware with a custom ROM that has better support for the Play Store. Last but not least, the battery life is a respectable 6-7 hours on heavy use with WiFi tuned on all the time. I am pleasantly surprised as the Onda V972 could only manage about half of that. I suspect that the firmware may have something to do with it. If you are buying the Chuwi V99 and expecting iPad-like performance, you will be sorely disappointed. While it looks very much like one and has a similarly awesome looking display, that is where the similarity ends. The Allwinner A31 gives decent performance but only if you don’t over stress it. If you understand the limitations and take steps to avoid them, the performance of the Chuwi V99 can be quite decent. The screen is gorgeous and watching videos on it is a pleasure. The Chuwi V99’s biggest selling point is probably its price. Online China retailers are selling it for slightly over $200 with free international shipping thrown in. For the price of a single iPad, you can buy 2 V99s and have enough left over to throw in couple of cases as well. If you can live with the device’s limitations, the Chuwi V99 is quite a good buy.